As all travellers will know, picking your luggage is something that should never be taken lightly. A bag that travels around the world with you needs to perfect… Or the closest thing to it! There’s no point having a bag that’s uncomfortable, difficult to use or annoying to manoeuvre on your travels, because on the road, your bag becomes a part of you! It’s the place where every piece of your vital belongings is kept; the place where your valuables are stored for the entire duration of your trip. It’s essentially your home away from home – so it needs to be secure, well-made and better yet… Sustainably sourced! 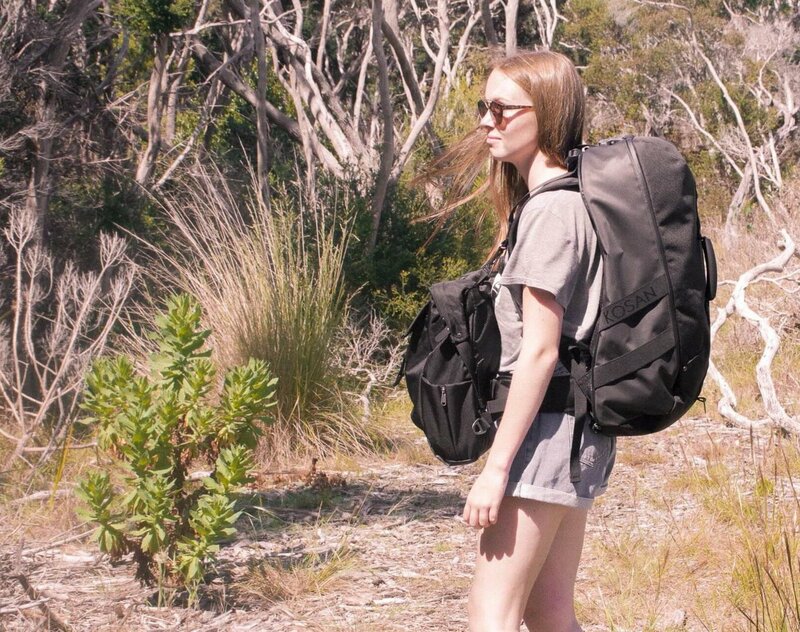 Thanks to the amazing team at Kosan, their new eco-friendly 5 in 1 backpack system, is the ultimate piece of luggage for anyone looking for a travel backpack to take on their global adventures. 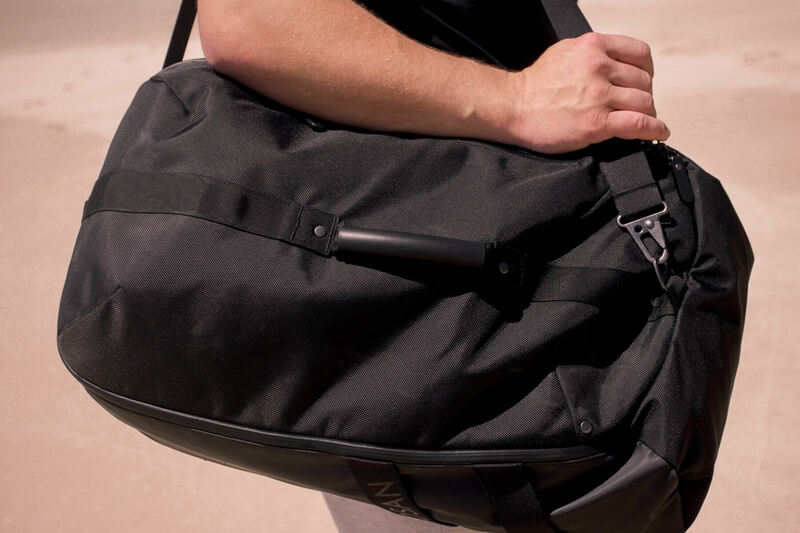 I’m sure you’re wondering how this bag could possibly be better than the well-known brands… This is 100% due to the fact that this company was founded by 2 avid travellers, who have travelled to over 30 countries and know the importance of finding the perfect backpack. These people know what it’s like to travel the world, and they’ve now used their knowledge to create the backpack system of every traveller’s dream. With 5 different carrying options and 2 separate packs, the Kosan travel system allows you to explore the world with a breeze. To begin with, the main 35 L pack is the perfect size to fit all your necessities and valuables whilst on the road. It features lockable zippers, a large clamshell opening, contoured mesh back for breathability, side access to laptop pocket (fits up to 15 inch laptop or tablet), hidden valuables pocket, internal compression straps and mesh compartments, waterproof cover, multi-purpose elastic sports strap, stow away mesh shoulder straps, adjustable sternum and padded waist strap and of course, a huge ‘carry all’ compartment for your belongings. You’d expect a bag with so many amazing features to be huge and oversized, but that’s not the case! It’s the perfect size for any body type, but especially for those like me that have a smaller frame. I’m pretty weak (yes, I need to go to the gym) and wearing a backpack can often wear me down. But with the Kosan backpack system, I feel completely comfortable and my back and shoulders are totally pain-free! It’s by far the most comfortable backpack I’ve ever tried, without any second thoughts. The great part about this bag is that it can also be converted to a duffle! This is especially practical for those moments when easy access is the most important thing. This strap is also slash proof and removable for added protection and comfortability. The small 15 L daypack is equipped with a 13 inch padded laptop compartment, RFID blocking pocket for your passport and valuables, a boarding pass slot, organising compartments, slash proof removable messenger strap, waterproof cover, expandable water bottle pocket, hideaway backpack straps and an added cobra buckle for extra security. If you’re looking for a day bag that has everything you’ll possibly need – this really is for you! I can no longer count the number of times that I’ve seen backpackers struggling to hold their luggage; carrying a huge backpack on their back with a smaller one hanging over the front. If you haven’t done this yourself, I’m sure you’ve seen someone who has. It looks painful, uncomfortable and very inconvenient, but this is where Kosan comes to save the day! With this backpack system, Kosan has ensured that functionality was there number one priority. That’s why they’ve created a system that allows you to be comfortable whilst entirely hands-free! As you can see in the image below, the small daypack clips on to the straps of the carryall pack with the help of 2 durable spring clips. This ensures that the weight is distributed evenly over your shoulders and your hands will stay free during all the necessary travel tasks. No need to have 2 heavy bags hanging over your shoulders… This system simply does all the work for you. The very best part of this company is that being sustainable is incredibly important to them. This product is created in an amazing factory in Vietnam that supports and cares for their workers, unlike many others that are used and abused around the world. The materials used are eco friendly, durable and non-damaging to the earth. I honestly have never found a backpack that has everything that a bag could possibly need, and this one has more. It’s high quality, the perfect size, convenient, functional and super stylish too! I’ve fallen in love… And to be honest, I think you will too. At Kosan, they thoroughly believe that travel is a solution to bigotry and prejudice; that we travellers can make an impact to the world we live in… And that’s exactly why the Kosan backpack system should be your next piece of luggage. To find out more about this incredible backpack, check out this video. But be warned… It’ll make you want to spend your money! CLICK HERE TO GET YOUR HANDS ON THE BEST ECO FRIENDLY BACKPACK SYSTEM – THE KOSAN 5 IN 1… Get in quick, big discounts apply! Disclaimer – This backpack system was sent to me by the KOSAN as a first test. Everything in this post is 100% truthful and I will be sure to use this bag for years to come. I definitely wouldn’t be an ambassador if I didn’t truly believe in this product – I truly believe it’s the best in the biz! The links included in this post are also affiliate. This backpack looks sooo good!! Can’t believe how much it can fit. Defo on my Christmas wish list!! Wow! This backpack is so clever and looks so practical… and I LOVE that it’s eco-friendly too! I had never seen it before so thank you for sharing it! Looks like a super comfy and practical backpack! Might consider purchasing one for my next big trip! I have seen this backpack everywhere and for good reason!! It is so useful and handy and great for me since I always take a carry on!! Thanks for the great guide! !